The Ultima Sensor Array provides flow, temperature and pressure signals in a compact unit that requires only one hydraulic line break. 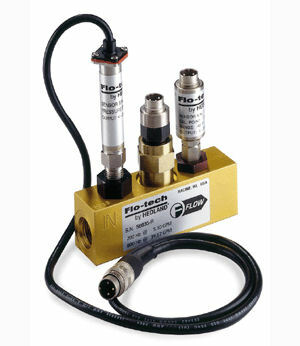 The magnetic pick-up generates a frequency output for flow rate measurement while the pressure and temperature sensors provide 4-20 mA output signals. The flow signals can be transmitted to Flo-tech’s F6600/F6650 Series, and the temperature and pressure signals can be transmitted to the F6700/F6750 Series digital displays or any other instruments that accept a frequency or 4-20 mA signal.Typical applications include flui characteristic measurement on test stands, stationary hydraulic system monitoring, feedback for hydraulic system control, advance warning of impending component failure and mobile hydraulics system diagnosis.